On the Sunday television talk show hosted by Anne Will, German Chancellor Angela Merkel stated her opposition to a change in course on refugee policy. A “national solution” was not in Germany’s interests. Freedom of movement within the Schengen zone had to be maintained. Instead of national borders, the European Union’s external borders had to be secured. Intensified efforts to this end were required, she said. Sunday’s broadcast was deliberately arranged to give Merkel the opportunity to respond to her critics. For months, right-wing Christian Social Union (CSU) chairman Horst Seehofer has been insisting on stricter restrictions on the number of refugees at the national borders. At the beginning of the year, Seehofer demanded an upper limit on refugees of 200,000 per year. At the frontier, “relations determined by law [had] to be reestablished rapidly”, he asserted. Otherwise, the Bavarian state government (in which he is Minister-President) would file a complaint against the federal government in Germany’s Constitutional Court, Seehofer threatened, even though the CSU is itself a part of the federal government coalition. The German government has come under immense pressure following the implementation of strict border controls by the Austrian government and others over the past week, and the decision by one Balkan country after another to shut its borders to refugees. Then Merkel explained that she shared the goal of her critics of sharply reducing the number of refugees. In the summer, she did not “open the borders”, as she was often accused of doing, she had merely not closedalready open borders. Today, she also wanted to defend open borders within the Schengen zone [the area comprising the more than two dozen European countries that have abolished passport and other border controls]. This was because the ending of freedom of movement within Schengen would mean the end of the common European economic market and, very rapidly, the end of the European single currency. 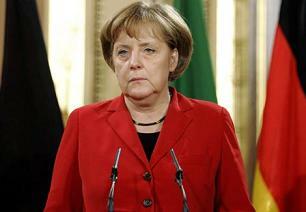 “From the standpoint of German interests, nobody can seriously want that”, Merkel stated. Therefore, instead of strengthening the European Union’s internal borders, the external ones had to be secured. This would not be easy, and required “difficult and sometimes very drawn-out” negotiations, but there was no way around that. The European Union [EU] had to learn to effectively protect its external borders, she declared, adding, “That’s why I’m for NATO intervention in the Aegean”. NATO units would support Frontex [the EU agency that patrols its borders] and the Turkish army in “the struggle against smugglers”, and secure the maritime border between Greece and Turkey. Collaboration with the Turkish government was thus indispensable, she continued. Much had been achieved in talks with the Turks. After the €3 billion [$US 3.26 billion] agreed upon by the EU had been made available, the building of mass internment camps for refugees on the Syrian border was proceeding apace. Germany was also directly involved. The German technical assistance unit (DTW) had been deployed to aid Turkish emergency services with providing for refugees. Merkel attempted to conceal her support for the sealing off of “fortress Europe” with humanitarian phrases. In Greece, one could currently see that the closure of the Balkan route did not “lead to the desired aim”, but had catastrophic consequences. Since Greece’s border was difficult to secure due to its many islands, refugees were arriving every day who could go no further and were massing in a country that is highly indebted, she said. The Greek government could not be left alone precisely at this moment, Merkel stated, noting she was in close contact with Greek prime minister Alexis Tsipras. Clearly the German government fears Greece could collapse under the pressure of the refugees––with 100,000 having arrived since the beginning of the year––with incalculable consequences for the finances and continued existence of the EU. The German government is therefore concentrating on militarily patrolling and securing the Aegean Sea between Greece and Turkey. At a meeting of NATO members in Brussels last week, details about the NATO deployment in the Aegean were discussed and finalised. German naval units have been operational since Saturday and are carrying out surveillance on the refugee routes around the clock. Their task is to punish “people smugglers” (i.e., target refugee boats) who were “similar to terrorists” and bring back refugees “rescued” at sea directly to Turkey. The “European solution” to the refugee crisis demanded by Merkel is increasingly assuming a military form. An emergency EU summit with Turkey is planned in Brussels next Monday, at which the cooperation on deterring refugees will be concretised. Ankara is demanding financial support for this. While the most prominent issues are financial support and visa relaxation for Turkish citizens, Turkey’s intervention in the Syrian war, where Ankara is determined to topple the Assad regime and prevent the emergence of a Kurdish state, will be discussed behind closed doors. Merkel has repeatedly spoken out in favour of the establishment of a “security zone” in Syria, a demand also raised by Turkey. This would necessitate a direct military intervention by NATO. In this context, an article published in the Süddeutsche Zeitung more or less simultaneously with Merkel’s talk show appearance Sunday was significant. Two leading representatives of economic think tanks, Michael Hüther (Cologne Institute of Economic Research) and Hans-Werner Sinn (longtime president of the Ifo Institute for Economic Research in Munich), demanded the construction of a “joint, European army”. The full-page piece began with a very sober assessment of the situation in Europe. Faced with financial problems and the unresolved refugee crisis, the EU is threatened with a break-up. “European politics has never appeared so worn out, disillusioned, divided and clueless as today”, the authors claimed. The refugee crisis made clear how deep the crisis of leadership in Europe was. A leading European power was missing. “The leading power in Europe in practice, Germany”, could no longer evade its responsibility. It was wrong to rely upon the borders being secured by Turkey. Instead, the creation of a “comprehensive European defence community” had to be adopted as a clear goal. Hüther and Sinn wrote, “Faced with the military flash-points in Europe’s environs, we consider it an unsustainable anachronism that the 28 EU states control 25 separate armies with their own general staffs, even though they are bound together in emergencies via NATO”. Europe needed a new project to maintain its unity. “Before the euro zone states involve themselves even more in a union of financial liabilities”, the Schengen zone states or the euro zone should come together to form a kind of “European defence community”. “A new, sustainable pillar of European cooperation [would be] based” on joint units and a command structure, “which gives the political union a solid basis and has a logic of political order”. With Merkel’s refugee policy increasingly assuming the form of sealing off Europe militarily, and with conflicts growing in NATO over the war in Syria, the demand is being raised for a European army under German leadership.